The success of your farm depends on your crop. You do everything in your power to ensure your crop’s success. But no matter how prepared you are, when something is out of your control, you need an insurer that understands your business and farming needs. AWB Broadacre Crop Insurance is designed to provide value for money and support, so you can get on with the business of farming, knowing you’ll have cover and receive support when you need it. Control and flexibility with the ability to structure a policy that can change with your season. Local and regional support with an AWB Representative who will work with you whenever you need. Worried about things you can’t control? Like, “Will I have enough soil moisture to plant a crop next year?” Or, “Once I have planted, will I get economical emergence?” It’s okay – at AWB we believe in giving growers like you peace of mind in more situations. That’s why in a first for agribusiness, you can simply add on Crop Establishment Failure cover when you take out a Fire and Hail policy with us. More cover. Less worry. Crop Establishment Failure cover forms part of your 2018 Fire and Hail policy and will cover you for your 2019 winter broadacre crop. If, due to insufficient soil moisture, you are unable to plant into the field you had prepared, or your planted crop fails to successfully emerge, then you are covered for your planting preparation and crop establishment costs incurred. 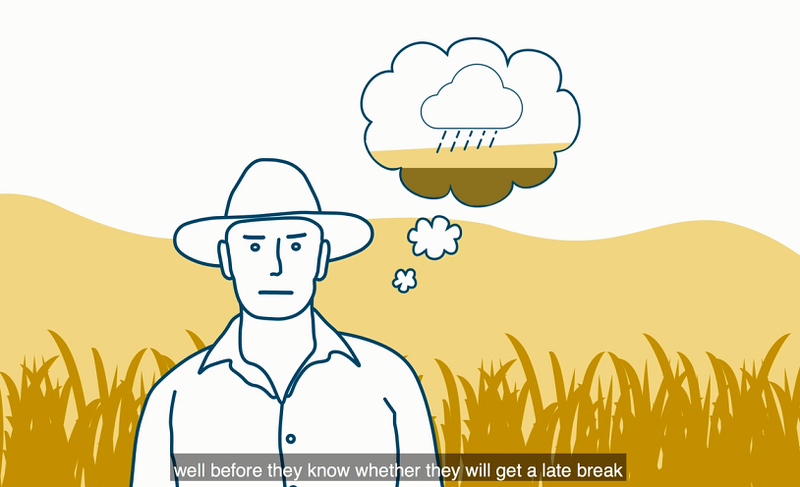 If you'd like to further understand what situations you can notify for a claim with the AWB Crop Establishment Failure Cover or how the claims process works, please watch this video. Worried about the things you can’t control, like frost damage to your crop? Things happen that no one can predict. That’s why at AWB, we offer crop insurance that gives you peace of mind in more situations. And, in a first for agribusiness, you can simply add-on Frost cover when you take out a post-harvest Fire and Hail policy with us. More cover. Less worry. Covers against yield loss to your wheat, barley and canola crops caused by the direct impact of frost. You know your crops best, so you can nominate the level of Frost cover to be insured. Follow these 3 steps to get a quote for Fire and Hail, Frost and Crop Establishment Failure Cover. When you’re ready to sign up, you can simply add cover for Frost or Crop Establishment Failure to your standard fire and hail quote*. Once you’ve signed up, you’re covered within 48 hours for fire and hail and within a week for Frost cover. To get started, contact our account management team at [email protected] or 1800 447 246 or simply speak to your AWB Representative. The information presented here is only summary in nature. Please refer to the Policy wording for full terms and conditions of the cover. AWB, its staff and agents are authorised to arrange this insurance as authorised representatives of AgriRisk. When arranging this insurance, Crop Risk Solutions and AWB act as agent of the insurer and not as your agent. Information contained on this page is only a summary of some aspects of the AWB Broadacre Crop Insurance Policy. Please refer to the Policy Wording for the full terms and conditions of the cover.